Do you believe you are being targeted for discipline or termination by a supervisor because of a complaint you made to your employer about a discriminatory practice? Have you been issued a performance improvement plan upon your return from a medical leave of absence that is unwarranted and only being issued because you exercised your rights under to take a medical leave of absence? Are being threatened by the investigator or managerial employee because you provided information during a sexual harassment investigation? You may be the victim of unlawful workplace retaliation if any of these or similar situations have occurred to you at your job. New Jersey law prohibits employers from retaliating against employees for complaining about sexual harassment and other forms of unlawful discrimination. The anti-retaliation provisions of the New Jersey Law Against Discrimination are to be construed broadly by our courts to promote the integrity of the underlying anti-discrimination and sexual harassment law. The statutory protections against retaliation are protect any person from reprisals, whether the person has filed a complaint on behalf of themselves or others or who have testified or assisted in any proceeding under the New Jersey Law Against Discrimination. 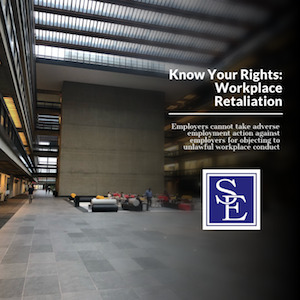 To establish a prima facie case of retaliation, an employee must demonstrate that: (1) he or she has engaged in a protected activity known by the employer; (2) the employer took adverse employment action against them at the time, or after, the protected activity took place; and (3) their participation in the protected activity caused the adverse employment action. What is Protected Activity Under New Jersey’s Anti-Retaliation Law? An employee must first prove that he or she engaged in protected activity to pursue a claim of retaliation under New Jersey law. The three (3) general categories of employee activity that are protected under the New Jersey Law Against Discrimination anti-retaliation provision are: (1) opposing practices or acts that are unlawful under the Law Against Discrimination, i.e., complaining about, or protesting against, discrimination or sexual harassment that occurs in the workplace; (2) filing a complaint or testifying or assisting in any proceeding under the Law Against Discrimination; (3) requesting from, discussing with, or disclosing to, any employee or former employee or lawyer whom the employee seeks legal advice or governmental agency equal pay information. What is an Adversement Employment Action Under New Jersey’s Anti-Retaliation Law? The termination of a person’s employment is the most common adverse employment action. However, a claim for unlawful retaliation the New Jersey Law Against Discrimination is not limited to just termination. Retaliation can take occur in situations short of termination. To establish that an individual suffered adverse employment action, an individual must show that a reasonable employee would have found the challenged employment action materially adverse. This means that the action would dissuade a reasonable worker from making or supporting a charge of discrimination. Under this standard, an employee is not required to show that she was discharged, demoted, or transferred to a different less desirable position or job location. Less-dramatic retaliation may still actionable under the New Jersey Law Against Discrimination anti-retaliation provision if it could scare a reasonable employee into not asserting his or her rights. While the New Jersey Law Against Discrimination does not provide an exhaustive list of what may constitute an adverse employment action, the New Jersey Model Jury Charge 2.22(2) states that “retaliation can include, but is not limited to, being discharged, demoted, not hired, not promoted or disciplined.” The existence of adverse employment action can also be shown through many separate, but relatively minor, instances of behavior directed against an employee that may not be actionable individually, but that combine to make up a pattern of retaliatory conduct. For example, providing a teacher substandard performance evaluations, transferring him to an inferior classroom, not providing him supplies, denying him a key to the science lab, rejecting photocopy services and providing him unfair treatment of class assignments could be enough, together, to constitute an adverse employment action. Whether someone has suffered an adverse employment action is often a fact sensitive inquiry that should be reviewed by an experienced New Jersey employment lawyer. How Does an Employee Prove the Adverse Employment Action was in Retaliation for the Protected Activity? 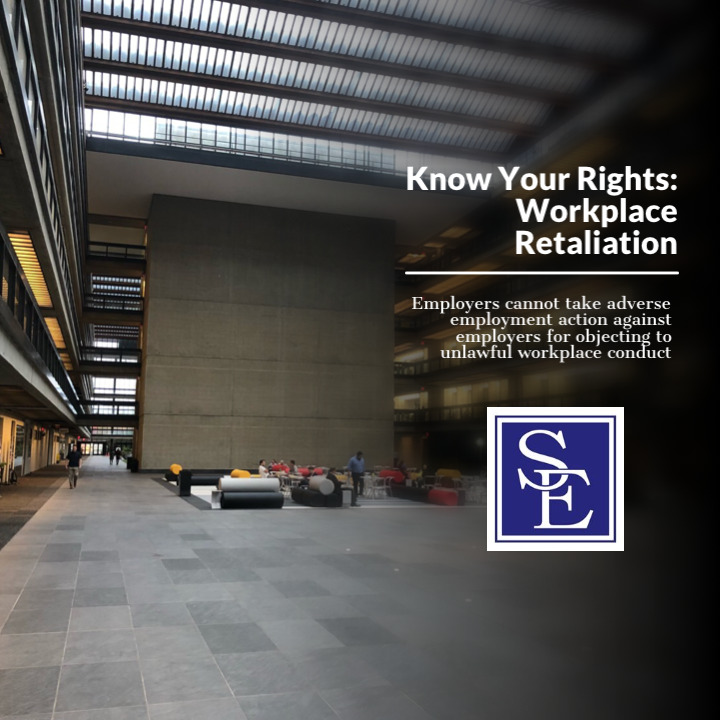 Just showing that the employee engaged in protected activity and suffered adverse employment action is not enough to establish a claim for unlawful retaliation. An employee must not prove both these elements, he or she must also show that the adverse employment action was caused because of the employee engaging in the protected activity. This element, of a claim of retaliation is commonly called causation and is usually the most heavily disputed in a retaliation lawsuit under the New Jersey Law Against Discrimination. Employers who are sued for retaliation often claim that the adverse employment action had nothing to do with the protected complaint, but instead, the employee was disciplined or terminated for poor job performance, a reduction in force or some other legitimate, non-discriminatory business reason. To rebut an employer’s legitimate, non-discriminatory business reason for taking the adverse employment action, an employee must show that the stated reason is a pretext, which means it is untrue or exaggerated. The timing of the decision, if the purported business reasons is well-documented and past practice are some of common ways to prove or disprove whether the adverse employment action was retaliatory or based upon legitimate, non-discriminatory business reasons. If you believe you or a loved one are the victim of unlawful workplace retaliation, it is imperative you immediately seek legal counsel from an experienced New Jersey employment lawyer. Our New Jersey employment lawyers are well-versed in the area of unlawful retaliation and are happy to speak to you about the specific facts concerning your potential claim.